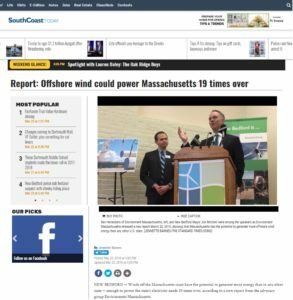 The following is a speech given by Southcoast Energy Challenge Program Coordinator Nicole Morris-McLaughlin on Thursday, March 22, 2018 at a press conference on Offshore Wind hosted by Environment Massachusetts and attended by New Bedford, MA Mayor Jon Mitchell. Highlights from the group’s recent report, “Wind Power to Spare,” were shared with the media. The study was funded by foundations that support Environment Massachusetts and its parent organization, Environment America; it was not paid for by the energy companies. This report put out by Environment Massachusetts makes us, The Marion Institute’s Southcoast Energy Challenge very optimistic. 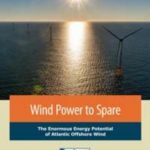 Optimistic because what it tells us is that residents are poised to benefit from Offshore Wind in multiple ways. First, residents will save money- bringing Offshore Wind onto our grid will stabilize energy prices and reduce the risk of residents seeing spikes on their utility bills. Coal, oil, and gas prices can increase based on supply and demand- wind is a free reliable resource that blows day and night. According to the report Offshore Wind is becoming cheaper and cheaper- this means the potential to lower residents’ utility bills. Second- Offshore Wind energy will bring good paying green jobs to the region and diversify our local economy- think a whole supply chain for the industry, technical training facilities and more hungry patrons visiting our local restaurants. Keeping more money in our local economies. Third- Residents will see improved air quality in their communities. This happens two ways- first by replacing out coal, oil, and gas processing with a completely clean energy such as wind we take harmful particulates out of the air. Also, once households have access to more affordable, clean energy it will usher in opportunities to switch out inefficient ways of heating our homes and powering our gasoline and diesel fueled vehicles. It has been well documented that Electricity- powered by wind will reduce asthma in the region, it will cut down on sick days and wages lost. This again means more money left in our pockets and an improved quality of life for residents. Fourth- Offshore Wind can help us meet the Massachusetts Global Warming Solutions Act to reduce GHS by 20% by 2020 and 80% by 2050. Offshore Wind is a viable tool to enable the transition to a 100% renewable energy-based economy. Switching to clean renewable Energy could eventually make us less vulnerable to natural disasters, saving lives and precious resources. Again, leaving more money in our pockets. We are grateful to visionary leadership on Offshore Wind in the region from Mayor Mitchell and his team. We need to hold more of our Public Servants accountable to do what is best for us. We are close to realizing a healthy, robust future where all our energy needs could be provided in a clean and affordable way. Read more about this press conference at SouthCoastToday.com.